In an age when social media and Internet forums allow people to share ideas and access information of varying degrees of credibility, doctors and patients sometimes end up on opposing sides when it comes to emerging medical procedures. Patients walk a fine line between evidence-based treatment and desperate optimism. For Trina Cooper, whose multiple sclerosis diagnosis was recently changed to the more severe secondary-progressive form, no cost or risk is too great for an intensive experimental procedure with the potential to halt the debilitating disease in its tracks. Cooper is working to raise money for a six-week course of HSCT, hematopoeitic stem cell transplantation, which she hopes will reboot her immune system. Preliminary results from trials are extremely promising, but doctors warn that the experimental treatment is not equally effective in all patients. Determining who is most likely to benefit from it is something researchers hope to do soon. Where patients may be willing to take risks, doctors must err on the side of caution, said Dr. James Bowen with Swedish Medical Group, one of the lead neurologists of the Seattle-based “HALT-MS” trials. “The worst of all possible situations — you’re potentially exposing the patient to a dangerous treatment, and you’re not answering the question,” he said. There is no cure for multiple sclerosis. The chronic disease causes the immune system to attack the protective myelin tissue surrounding nerve cells, which damages the nerve fibers and disrupts communication between them, leading to symptoms like vision problems, numbness, dizziness and difficulty walking. The most common form of MS is relapsing-remitting, in which periodic attacks on the myelin cause temporary flare-ups of symptoms. That’s what Cooper was diagnosed with in 1994 when she was 33. Earlier this year, however, doctors upped her diagnosis to secondary-progressive, which eventually happens to most people with relapsing-remitting MS. Secondary-progressive appears to be driven by ongoing neuro-degeneration, rather than intermittent inflammation, and doesn’t respond to therapies that regulate the harmful auto-immune response. At a certain point, the nerve cells just continue to die, even in the absence of inflammation. Degeneration becomes more steady, disease-modifying treatments become less effective, while fatigue, mobility problems and difficulty with memory or concentration can become more pronounced. In the United Kingdom, Bebo said, a trial is looking at an epilepsy drug to slow neuro-degeneration, with some exciting preliminary results. HSCT has been used to fight various cancers, but in recent years has been explored for use in auto-immune disorders. In Seattle, Bowen and a large team of far-flung researchers began the HALT-MS study in 2009, treating 24 patients in 2012. The team published three-year results in February, showing that most patients saw their disease stabilize or improve in that time, and will continue to follow the patients for another two years. The treatment basically guts and then rebuilds the entire immune system: Doctors give patients a drug that makes their bone marrow pump out stem cells, which are collected from the blood and frozen. The patients are then given a large dose of chemotherapy to kill off their bone marrow and white blood cells. Then doctors put the stem cells back, which repopulate the bone marrow and rebuild the immune system — without the auto-immune disease that was there before. So it’s a bone marrow transplant, but with your own bone marrow. HALT-MS is the second study by this team, Bowen said. The first looked mostly at people with secondary-progessive MS. Through that study and others worldwide, researchers have found that people respond best to the HSCT treatment if they have relapsing-remitting MS rather than the progressive forms. Of the patients in that first study, Bowen said, about 40 percent had remained stable after six years — their disease had not continued progressing — while 60 percent saw some decline. The theory was that they were too late in treating patients whose disease had moved from inflammatory to degenerative. The second study, then, was designed to see if the treatment really does work better for relapsing-remitting. Patients must be kept in isolation for a few weeks as their immune system reboots to reduce the risk of infection. As someone with secondary-progressive, Cooper feels she’s hit a wall. She does not meet the criteria for studies like HALT-MS, which is not accepting new patients anyway. Other emerging treatments she’s researched aren’t projected to become available until at least 2022. 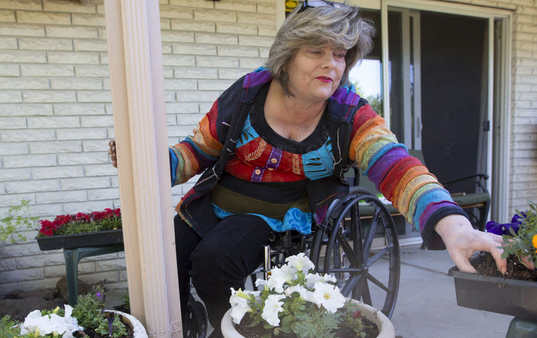 She’s confined to a wheelchair and often needs a full day to recover from activity. She also cares for her mother who has Alzheimer’s, and is terrified by the likely prospect of her own cognitive decline caused by the MS. The disease-modifying injections used to treat MS cost $60,000 a year or more. Progressive MS is also treated with chemo drugs, but Cooper, who is insured, can’t stand the idea of enduring regular chemo for the rest of her life, with no hope of remission. With three grown kids and two grandchildren, Cooper wants a chance to live her life as fully as possible. “I don’t want them to know me as, ‘Oh, we saw grandma, she was in bed,’” she said. A one-time six-week course of HSCT in Puebla, Mexico, where a doctor is willing to perform the treatment, costs about $50,000, Cooper said, plus travel costs. She’s got $14,000 left to raise, which she’s doing via a raffle and with the organization HelpHopeLive, and has postponed her scheduled treatment from the end of May to August to give her more time. Another Yakima woman, Mikal Heintz, is working to get treatment for her mother, who is 65. She’s hoping to be accepted into a clinical HSCT trial in Chicago early this summer, but if she isn’t, Heintz said they will pursue the treatment in Mexico, as well. From the research side, though, Bowen says doctors must move slowly and continue their studies, both for the safety of patients and to ensure development of future treatments.